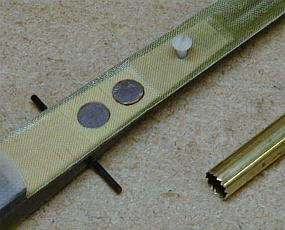 The following two pictures show how to modify a standard Taboo fuselage for ballast installation. 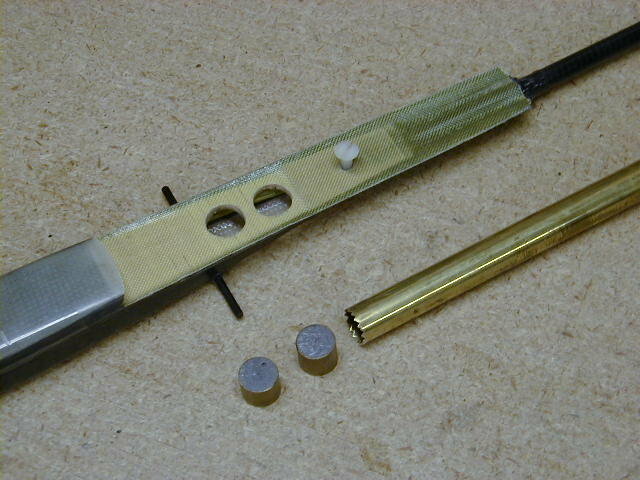 You will need a brass tube about 15-17mm in diameter for making the ballast slugs and for "drilling" the holes in the fuselage deck. 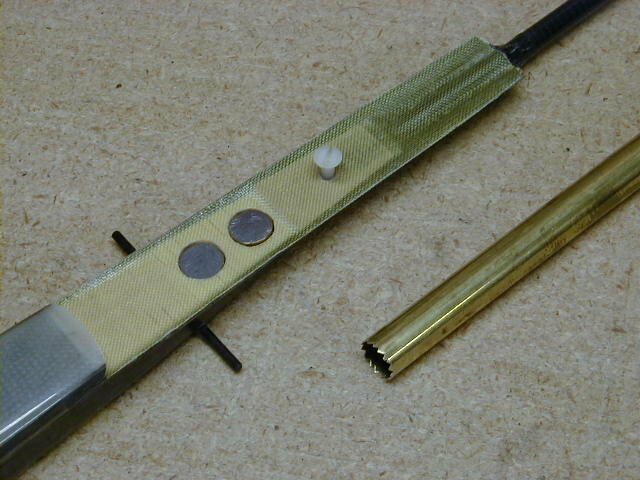 To turn the brass tube into a hole cutting tool, use a sharp file and make small teeth on one end of the tube as shown in the picture. Then carefully make 2 holes in the fuselage deck by turning the tube and pressing on it. Be carefull not to tear the balsa under the kevlar when making the holes. 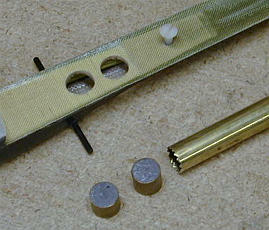 To make the ballast bullets, cut 2 pieces of the brass tube long enough to go from the bottom of the fuselage up to the deck surface. Melt a small amount of lead, set the brass tube pieces on a heat resistant surface (cement driveway, or even a piece of wood will work) and fill it with molten lead. Use sand paper to enlarge the size of the holes so that the ballast slugs go in easily without binding. Soak the edges of the holes with thin CA for reinforcement. The ballast slugs simply drop into the holes and are then closed by the wing. Ballasting a Taboo is then only a matter of un-mounting the wing (one bolt), dropping the sugs into the holes, and mounting the wing back. Very clean and convenient, especially during a contest with changing wind conditions, when you may have to make a quick decision about putting more ballast or removing some just before the round. The two bullets have the total weight of about 1.5oz which is adequate for most windy days. During the last contest (CASA hand-launch contest) I found out that this is not enough for the extreme winds and turbulence that we experienced there (up to 20mph gusts) and I used about 0.8oz more lead putting it between the servo and the main bulkhead. This did not seem to affect the CG noticably and I did not feel any difference in handling. If you think you will have to fly your Taboo in such high winds, you may want to make 3 ballast slugs and 3 holes, positioning the front hole just in front of the fuselage throwing peg (if you are using one). This is still very close to CG and should not affect the handling considerably.